Edinburgh tops list with almost 1000 renters failing to reclaim their money. Tenancy deposits worth hundreds of thousands of pounds have been left unclaimed across Scotland, it has been revealed. In total, 2693 deposits have not been claimed, worth a value of £692, 838. Edinburgh topped the list, with 919 tenants failing to reclaim deposits totalling £219,559. That number is more than double Glasgow's total of 417 unclaimed deposits, valued at £113,422, and three times that of Aberdeen's 246 deposits totalling £73,023. Shetland was last on the list with just one unclaimed deposit of £350. 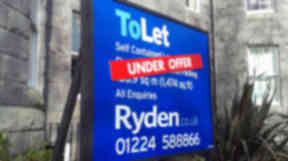 The tenancy deposit scheme was introduced in 2011. Deposits are banked with third-party schemes as protection for both tenants and landlords. One such scheme, SafeDeposits, is now urging tenants to get in touch and recover their money. Victoria Nixon, operations manager, said: "It's interesting to see the disparity in rates of deposits left unclaimed across the country. "The reasons behind it may be complex and varied and we can only speculate on what they may be. "Some people may simply forget, some might think they won't get it back and others might think it's an inconvenience." She added: "But in reality the process is straightforward and, should disputes over deductions arise, an independent adjudicator will work to find an amicable resolution for all parties. "Tenancy deposit schemes like SafeDeposits Scotland were introduced to help tenants and landlords get a fair deal at the end of a lease agreement and claiming your deposit is straightforward."